Die cast aluminum construction with special sealing and nylon PA66 clamping glands makes this a true IP67 protected Junction/Summer Box. Accepts from 2 to 4 inputs with cable size from 3.5mm to 7.0mm in diameter. Excitation trim, jumpers to enable direct mV/V calibration from PT data sheets and for installations such as silos, tanks or hoppers where loading corners for adjustment is impractical. 4.2 % load cell adjustment. 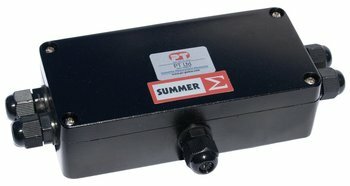 Unlimited extension for load cell connections. Brochure for PT100SBE Junction box. Instructions for installation and adjustment of the PT100SBE junction box.